five-alive is looking back on more than a decade as mobile destination for PDA and smartphone enthusiasts from all over the world. Starting as a private project in Berlin/Germany with about 20 mobile links in December 2000, five-alive grow up soon to a size of more than thousand mobile links and a international community of more than ten thousand users a month. Nowadays, browsers and websites are able to recognize whether you want to enter a mobile or a standard website. That makes mobile web portals like five-alive obsolete. 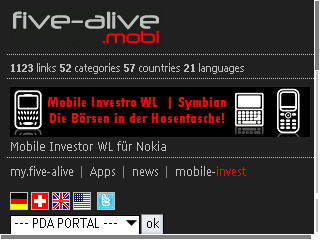 As a result of these developments, five-alive decided in January 2013 to close down its mobile portals, in particular five-alive.mobi and mobile-invest.mobi, as mentioned sometime before. 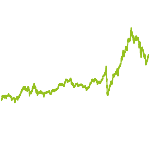 five-alive, meanwhile part of the five-alive AG, will stay in the „mobile business“ as contract developer for mobile applications (apps) and vendor of mobile and web based service (cloud services), as well as an investor with mobile focus at the five-alive portfolio AG.